It's the 1st of the month, so it must be time for another fantastic release from Doodle Pantry. Laurie has outdone herself once again. 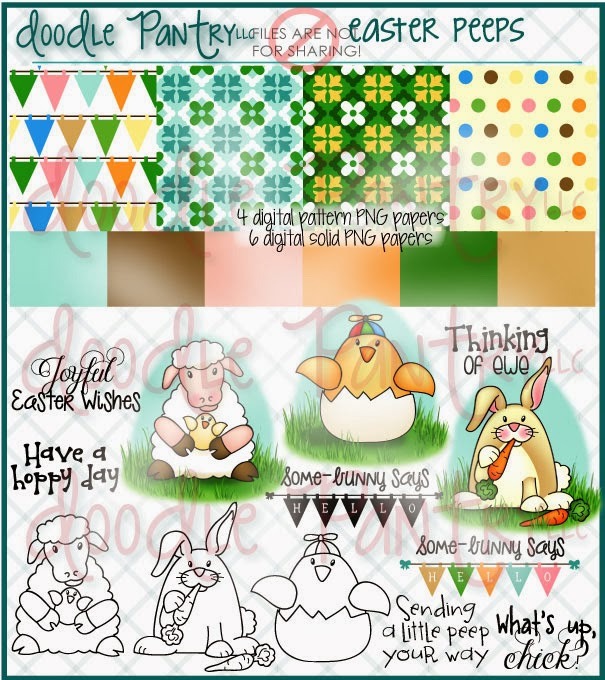 Wait until you see all the fabulous digital stamp sets, designer papers and .svg cut files being released today. At noon today, the new challenge DPDC43 begins on the Doodle Pantry Blog. The challenge runs from February 1 - 24. You may use any stamp you wish to enter the challenge for the $15 gift certificate, but in order to receive the stamp set that is given away to everyone just for joining the challenge, you MUST use a Doodle Pantry image (not just a sentiment). There are so many free images on the Freebies page, it will definitely help you get started. The free set given away this month is Easter Peeps. And don't forget to look at What's Free with Purchase before checking out. Be sure to add them to your cart. Wow, this is positively stunning. Love everything about this beauty. Your coloring, card shape, and fabulous design rocks. WOW FACTOR! I love how you colored the image and added sparkle to the wonderful saddle. Your layout is positively amazing. Thank you so much for sharing your inspiring creation with us at 4 Crafty Chicks Anything Goes Challenge. Have a great day! Susan, Glad you're joining us at Simply Create Too for our Mother's Day/Female Challenge. Your bendy, carousel card is so very pretty. Hi Susan, how fabulous! I have been wanting to try one of the bendy cards. You have inspired me. Love the sparkle on your horse and can't wait to see what you do with the upcoming sets. Susan, your card is just adorable. I love this bendy card, it is so perfect with the cute image. Thank you, for joining us for the Speedy TV Inspiration challenge. Your card is delightful,but unfortunately you have not followed the remit for our challenge "Shade's of the Same Colour" meaning varying shades of the same colour as stated. As a prize winning challenge blog,we do have to be strict with our rules. You are welcome to re-enter our challenge with any entry that follows our remit. Fabulous bendy card design, it's a beautiful image and love how you coordinated the colors for this card! Thanks for joining in our Anything Goes challenge over at the Outlawz Twisted Thursday! Wow,that card looks really... round! Perfect for your carousel themed card. Thanks for playing along with the Daring Cardmakers this week! Love your carrousel card so beautiful! Have a Blessed day! Thanks for playing in our "For the Little Girls!" 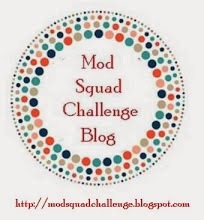 Challenge #84! Clever card! You put a lot of time into it! Thanks for joining us at Simply Create Too!! Love your carousel horse, he is magnificent. Totally fabulous card Susan! This is such a pretty card, I love how the image goes above to top, it makes it stand out even more. Thank you for joining us this week at the Sassy Studio Designs Challenge! I hope you play along with us again soon! Gorgeous Card! Love that image! Great details and it is so elegant. Thanks for sharing it with us in the Pattie's Creations Challenge! Back again! Thanks for entering this beautiful card in the MFPSpeedyTV challenge as well. It is really, really pretty. Love your kitties at the top - George and Molly! This is truly gorgeous! I was scratching my head with this pretty image and now your card is my inspiration! You sure did a beautiful job with your card and the coloring of the carousel horse is fantastic. First thanks for joining us at Twisted Thursday and also thanks for joining us at Color Me Creative and good luck on the challenges. Wow I've never done a bendy card it's amazing! Fantastic coloring, just gorgeous Susan! Gorgeous!!! Thanks so much for participating in our QKR STAMPEDE challenge!! Hope to see you again for our next challenge!! Sweet card Thanks for joining in with us this week at Graph'It colour challenge. Wow, was für eine tolle Karte. Richtig klasse gemacht.Danke für Deine Teilnahme bei Fairy tale Challenge. Lovely card. Thanks for playing with us at Izazovi i sladkiši. Wow what a fabulous card,thanks for joining CCT this week! Lovely card Thanks for joining in with us this week at Graph'It colour challenge. A fabulous card! Love your colouring! Thank you for playing along with us at Crafty Catz. Good luck! Gorgeous card, thanks so much for joining us over at Craftitude! DT for Pattie's Creations Challenge! Beautiful card! Thank you for joining us at Fairy Tale Challenge. Great project! Beautifully done. Thanks for joining us at CMC. Fabulous card!! Thanks for joining us this week over at the Graph'It color challenge!